If you have a Facebook account and care about your social life, you should know how to use the platform wisely to your benefits and not let it become a burden in your life. Facebook CEO Mark Zuckerberg said that the platform is for connecting people, but how you use it matters a lot. To make Facebook work for you and add additional value to your real life follow the following guidelines. Things not to do on Facebook. 1. 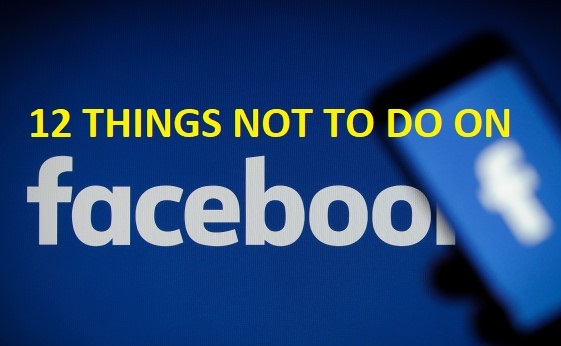 Don’t Mix Business and Pleasure: Never use your personal Facebook account for your office work. If your job demands that you should have a Facebook account, create a new account where you can post only business related information. Many times people learnt the hard way by not separating the two. Even if your boss asks you to do some promotion on Facebook about your office, it's better to politely turn down the request. 2. Use Caution Posting and Tagging Photos: Don't post anything that comes to your mind. Be cautious. Have a second thought and then take a judicious decision. And when it comes to tagging, many people are making huge mistakes by tagging their friends which they usually don't want the world to see. So, tag your friends wisely. 3. Don't use a hashtag: If you are using Facebook as a personal medium of communication, there is no need to use hashtags. For example, if you use a #sundaydress and you post your photo on your timeline/wall, it will be visible to the whole world (if your privacy setting is set as 'public'). 4. Avoid Over-Sharing: There is a great urge to share about your life experience with 'friends'. However, remember that all your 'friends' on Facebook are not going to be exactly who you can call true friends. So, don't share everything about your life. Save something for yourself. 5. Don’t Misrepresent Yourself: It's easy to misrepresent ourselves on Facebook. Many people do this by posting ideas or stuff that they would not normally say or do in real life. Be realistic as much as possible. 6. Don’t Drink and Post Updates: Some of the most embarrassing updates and photos posted on Facebook are by posted people who are in an inebriated state. It's better not to be online when you are under the influence of alcohol. 7. Never share your financial data: This is quite straight and simple. However, people still do it. Some people still share their financial data over Facebook messengers and sometimes to people with whom they are not familiar. 8. Never accept 'friend' request from people you don't know: Keep away from unknown person who may request your friendship. Once you accept a person as your 'friend', you should know that you are giving full access to your profile and your social life. 9. Don't share anything that may be of embarrassment to you at later stage: Even if you think it is funny or clever to post that silly behaviour of yours, take a second look by asking yourself how will people look at this later. Never post something that can be taken out of context. 10. Be judicious in sharing your political views: Politics divides even family members. You may be a right wing or left wing or centre in politics, and if you still do want to express your political views, do so with care. 11. Never abuse anyone unless you are ready to reach up to the court level or are willing to apologise. 12. Never post cryptic status: Posts like this "Can't believe what just happened..." without a follow-up message is a big turn off for your friends. Some people also post update status like, "I finally know who my friends are now."